﻿ Comparison of the most popular online navigation maps. Comparison of the most popular online navigation maps. How to Create Custom Map Directions Using Google Maps. How to Fix Google Maps Showing Blank Maps When Using Google Chrome. How to Make Google Maps Remind You Your Bus, Tram or Tube Stop is Coming Up. How to Avoid the Massive Black Friday Crowds Using Google Maps. 10 Essential Things You Should Know How to Do in Google Maps. Most of the latest map services are available in two versions. The standard version works in a browser window on any computer, while a mobile version is designed for smartphones, iphones and other devices. By no means, Google Maps is superior map service in the world. It is also the most extensive and most accurate site of its kind, which can be used by an ordinary man. The interface consists of a main window with a plan or map, sidebar and search engine. It brings lots of features that other services don't offer. These include a 3D view, voice directions, and automatic route recalculation, to name a few. Within the main window you will find the basic controls that allow you to easily get around the map, change the zoom, integration of satellite images, and more. The sidebar is used for routing and creation of your own maps with markers. There is no point to linger on the search engine. Google Maps provides satellite images with several levels of detail. When it comes to less urbanized areas, the images are of low or medium resolution. Big cities, in turn, are presented with much more larger pixel density. We can even discern the roofs of individual buildings. 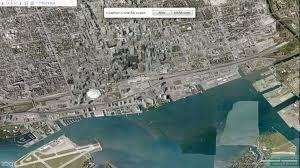 If you increase the zoom, you can activate aerial photographs (if available). Instead the view from the top, the service displays isometric developed view like in strategy games (RTS). The images are so extensive that you can even see the color of the shirt hanged on the balcony. If you zoom in to maximum, you activate a Street View mode. Since then, instead of bird's eye view, we walk on the streets looking at the buildings, cars and people. It gives you a street view of where your destination is located as you approach. That way, you can recognize the surroundings. We can even read what is written on signboards in front of shops and service points. The real strength of GMN is the most comprehensive traffic data (based on number of streets covered) and the clearest presentation of information. Google Maps offer a convenient way to get a quick look at traffic. Not to mention the possibility to change the overlay from live traffic to projected future traffic on the basis of history. It saves your time when you have an overcrowded street ahead of you. What is more, Google Maps provides nicely labeled pedestrian, public transport including buses, trains and subway, added to it bicycle directions. Switching among them is dead simple. GMN provides quite accurate foot and public transport directions, however bike directions need some improvement. Bing is arguably the prettiest navigation service. The clean and easy to use layout combined with a color scheme make it one of the best hand-holdings. The only complaint is that we have to go back to the search page in order to reverse our route. It is slower than Google Maps but provides excellent navigational tips using landmarks. Amazing bird's eye view aerial maps has the best-quality images of all the services, but the biggest annoyance are difficulties in finding a streetside views with actual coverage. Some places are simply unphotographed, what may cause problems for travelers driving in an utterly foreign area. The traffic system is a little bit limited when compared to other services. It sometimes doesn’t display traffic data, so you have to zoom in or out in order to check it properly. And lines are almost invisible, what makes it difficult to make out without looking at the map. Another great advantage about Bing is its coverage of accident and construction issues. Considering these aspects, we have to claim that they are clearly presented on the map and in a more understandable way than those of service of its kind. Bing also comes with public transit directions, however they are not as good as Google's. In turn, walking-only directions are even better than Google's. The service provides 3D interface, which is cool to play with. All in all, Streetside is a decent service that is constantly developing. Since it offers 3D interface, which takes you out of the street level and up to a bird's-eye view in a single click, together with pan, zoom, rotate, and many more functions. MapQuest is one of the original service in online driving directions with free voice prompts. With MapQuest we can calculate directions, print out, share them on Facebook or email in order to consult while driving. Getting driving directions is amazingly simple. When it comes to entering starting and ending addresses, there is no difference. The easy to follow voice prompts for route directions guide you while driving. The guidelines are mostly accurate. The service provides a simple search box for entering destinations. The application is available on iPhones and Android. There is no sort of offline mapping. MapQuest brings the most complicated layout, which includes a four-item form to fill in while looking for directions. The downside is that it takes the whole screen, so in order get the directions we need scroll down the page. It’s impossible to see both directions together. Among the best things about MapQuest is the inclusion of the Avoid button. It is located next to every turn. It allows users the possibility to bypass problematic crossroads that the service may not know about, without a need to determine an alternate route. MapQuest's street coverage is clear and transparent, similar to Google's. The lines can be difficult to read as they are very wide. Regarding traffic data, they are not always accurate. While MapQuest can be a good choice for car drivers, it doesn’t offer a set of directions for pedestrians, bicyclists, or people using public transport. 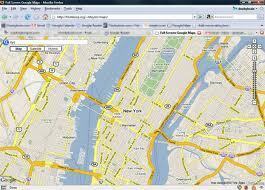 Yahoo Maps is another example of extremely viable mapping solution. The first thing we need to mention is the overall simplicity of use when compared to its competitors. Yahoo Maps comes with a nicely-designed two window interface, which consists of two search boxes, which make it easy to find any place when you are out and about. To see a map for driving directions, insert an address into text box A, then into the second text box. You can also create multipoint directions, if you desire. In almost all aspects, Yahoo Maps is as good as Google Maps. It empowers users with the ability to find the tiniest street in any city in the World within a click of a button. We can zoom in and out into the level of detail we need to. 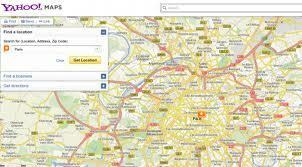 What is more, Yahoo Maps offers blazingly fast and intuitive search tool what makes things even easier. With Yahoo Maps we can create a route with multiple destinations, find local attractions, discover traffic data and find more detailed information about businesses and points of interest. It’s main advantage is the ability to upload received information by email or text message, what makes it a strong competitor on the navigation market. Similar to other services we can view satellite images or as a standard line drawing. 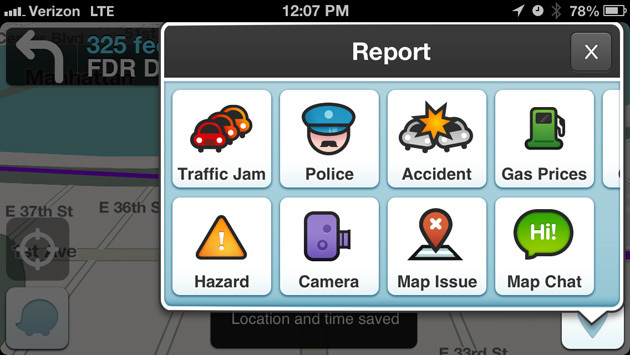 Waze is a free app that has proven its reliability and keeps getting better. The application was primarily designed as a means for users to report traffic conditions but it has evolved into a powerful navigation app. It offers free voice prompts, user-reported traffic jams and even shows fuel prices for gas stations. The maps are constantly updated by members, and are getting more and more accurate. The only downside is that we cannot download it, so it works in areas with a wireless data connection only. The interface consist of a classic map view, which can be set either to 2D or 3D views, and a search box. It shows traffic flow data on streets together with icons indicating accidents, speed traps, police, traffic jams, and other Waze users. All the information is reported by users. One of the greatest things about Waze is auto-rerouting feature. It informs you about traffic jams or accidents playing out ahead of you, letting you choose an alternate route. Another interesting thing is that we can use voice command to initiate a destination search. The voice prompts are quite understandable, comparable to Google Maps. Apart from voice prompts, Waze also recalculates the route quickly. Once you select the destination, it shows the estimated time, taking into account traffic conditions on the basis of information reported by Waze members. Regarding privacy issues, Waze loses a lot. Of course we can stay anonymous on the Waze map by not registering for an account, but other users will still see where you are. Waze is a perfect solution for everyday driving and is definitely worth checking out. It's comparable to Google Maps, mainly thanks to its focus on crowdsourcing, rich community of users and overall stability. And on top of this, it’s free. To conclude, GMN definitely stands out as a top choice providing the best image quality and performance, though not entirely without flaws. Even though it is our clear winner, winning almost every test category we looked at, other services has also manyattractive advantages. Bing makes room for itself through a large database and its wonderful Streetside project. 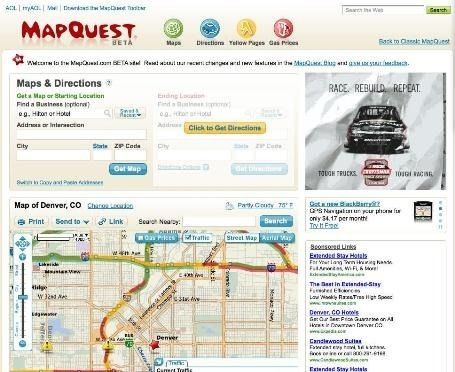 When talking about MapQuest it unleashed new horizons for navigation market. Yahoo! Maps, on the other hand, is also a great service for planning trips. If you had used any of the aforementioned services for navigation purposes, let us know your opinion in the comments section below.